Keep up your calls and letters – they will move our Representatives to act on our behalf, despite pressures from others in government to discourage them. Send them thanks especially so they know that we see when they do the right thing! WASHINGTON, D.C. – Today, U.S. 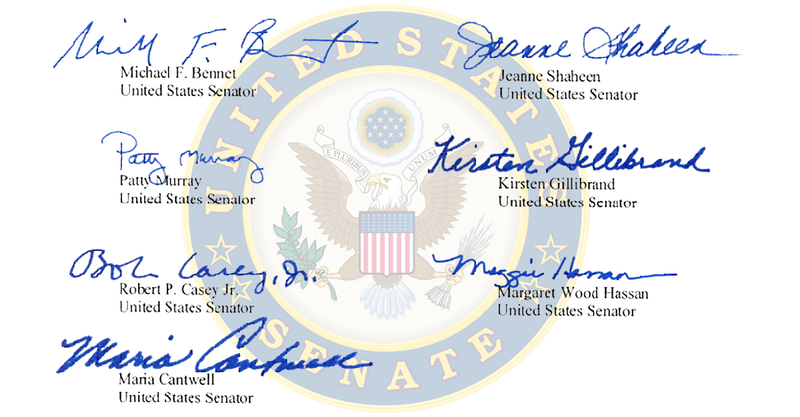 Senators Patty Murray (D-WA) and Maria Cantwell (D-WA) joined Senators Michael Bennet (D-CO), Jeanne Shaheen (D-NH), Maggie Hassan (D-NH), Kirsten Gillibrand (D-NY), and Bob Casey (D-PA), to write a letter to the Senate Appropriations Committee urging the Department of Defense (DoD) to investigate and clean up chemicals that have contaminated drinking water sources across the nation. Per-and polyfluoroalkyl substances (PFAS) are chemicals found in firefighting foams that had been used at military installations and civilian airports. The chemicals have been detected in groundwater and drinking water wells near these entities. While the health effects of these chemicals are still being determined, studies have linked PFAS exposure to developmental damage, certain cancers, and immune system dysfunction. In the letter, the senators urge the Committee to fully fund a study included in the Senate Version of the FY18 National Defense Authorization Act (NDAA) on the cumulative health effects and impact of PFAS exposure in water sources. The letter also encourages the Committee to direct DoD and military services to robustly budget for assessment, investigation, and remediation activities. Finally, the letter requests investments to eliminate the current use of this generation of contaminants, which would reduce the cost of future remediation efforts, and to research firefighting alternatives that do not contain PFAS. DoD has identified over 400 installations with a known or suspected release of PFAS that requires additional investigation. Three Washington state military facilities, Fairchild Air Force Base, Naval Air Station Whidbey Island, and Join Base Lewis-McCord have detected elevated PFAS levels in groundwater wells used for drinking water. In the case of Join Base Lewis-McCord, contamination was contained and did not spread off the base. I just moved here, and did not know we had this problem until now. Ugg. 🙁 How can I better protect myself while living here in Coupeville?